The default sniper is great for begginers and mid-range supporting classes, but lacks in the ability to go for longer distance shots without the knowhow and practice. 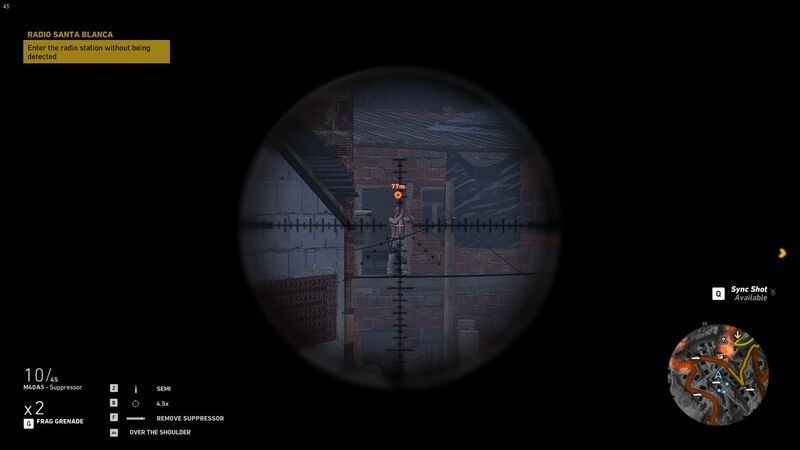 To start off, we need to get rid of the 4x Acog scope on the M40A5 and go for a better optic. 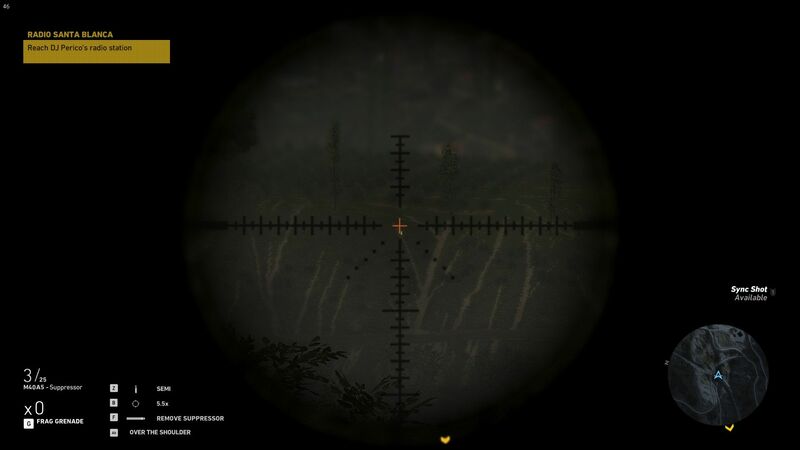 The easiest to get at the beggining of the game is the TARS101 scope, it provides 4.5x - 5.5x magnification and grants you much more bearable mil dots for use in long range combat. This item can be found in the Pacura region. At this point, there isn't really any point in trying to obtain a better tier sniper rifle, as it may lead to getting killed alot, this is because these weapon cases are in the higher difficulty levelled regions and the bases in which they are located in are heavily fortified and will be insanely difficult at a low level (unless you went at the lowest difficulty. Wuss). Enemies vary over distances in different situations, obviously, so you need to compensate for the bullet drop that will occur when you take your shot. 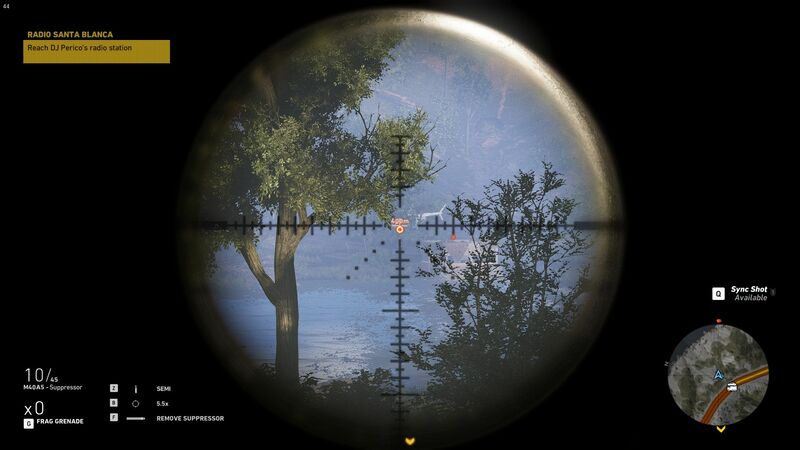 Shots will become noticebly effected by bullet drop at around 300 meters, this is when you need to aim up just a bit from the crosshair, not too hard, but longer distances will give much more of a challenge. As well as bullet drop, when shooting at distances over 300 meters you will have to become more aware of your weapon's bullet velocity, this is the speed at which the bullet goes upon being fired from the gun. If it is slow, the bullet will take longer to land at your desired location, which will require more compensation if the target is moving. mastering your weapon's bullet velocity is key to later parts of the game where the Secarios constantly move around their camps and bases. 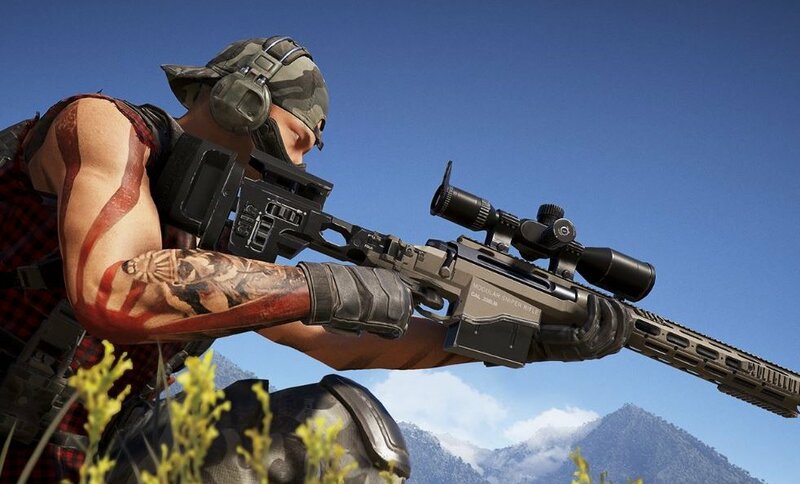 To get better at shooting with your weapons set velocity, you must practice, the best feature about Ghost Recon Wildlands is that every gun has tracer rounds (for some reason) use them to your advantage in mastering your weapon. Example of tracer rounds ingame (hard to take a screenshot, sorry). (Definition of a tracer round in case you don't know). Tracer ammunition (tracers) are bullets or cannon caliber projectiles that are built with a small pyrotechnic charge in their base. Ignited by the burning powder, the pyrotechnic composition burns very brightly, making the projectile trajectory visible to the naked eye during daylight, and very bright during nighttime firing. This enables the shooter to make aiming corrections without observing the impact of the rounds fired and without using the sights of the weapon. The mil dots on your rifles scope are the black (or may be colored) notches that help the user compensate their shots over a long distance to hit target with accuracy. 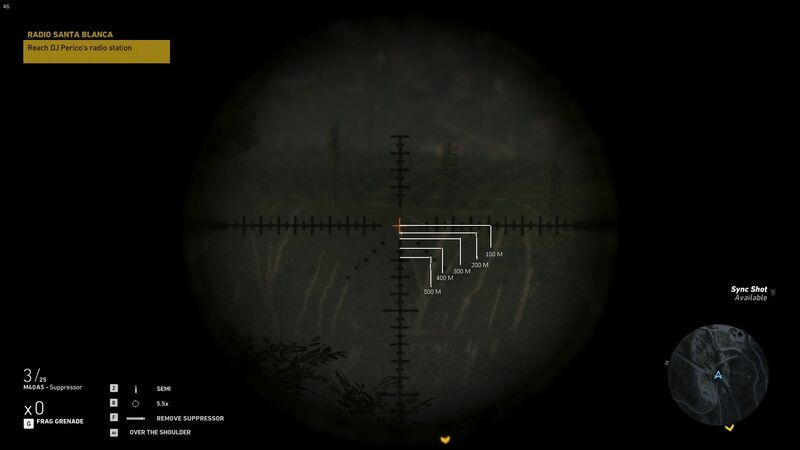 In real life, mil dots on scopes require mathmatics to measure the target with the mil dots and multiply their size in inches by the distance from where you are they where the enemy is stood in meters (or yards). 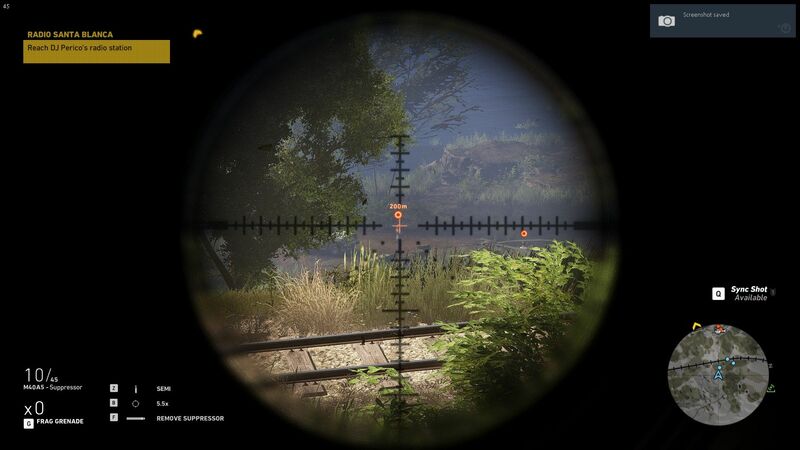 This is one of the real life methods that help snipers get accurate shots upon their targets, but within Ghost Recon WildLands, it requires the knowledge to know which notch to aim with. These are some positions that can show you roughly where you have to place your mil dots to kill an unarmored enemy. These work for me 80-90% of the time. Each enemy has their own amount of health points, these effect how many shots it takes for your rifle to kill an enemy. Most enemies take only one shot to kill, but some armoured opponents need to be shot in a specific place to ensure a kill. 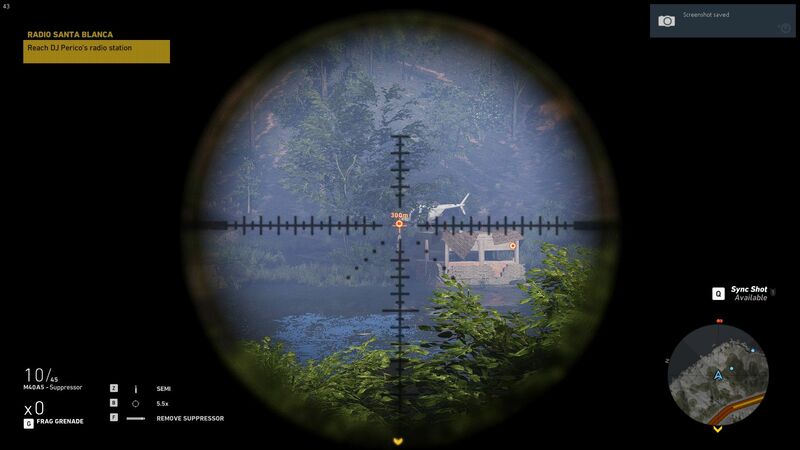 These are the most common enemies you will encounter during your travels throughout Bolivia. Uses Smg's (can also use an M40A5 if spawned inside a watch tower). One shot with almost any weapon. Has more Health points than a Grunt. One shot kill from any sniper anywhere on the chest and head. Has even more health points than a Secario Grunt. Uses assualt rifles (can also use an MSR sniper if spawned inside a watch tower). One shot kill with any sniper from the waist up. Each enemy type has their own way to engage the player, Sicario's are usually reckless and can be easily shot even when in cover. After a time after engaging, they will eventually grow tired and decide to rush you, so be prepared for that. 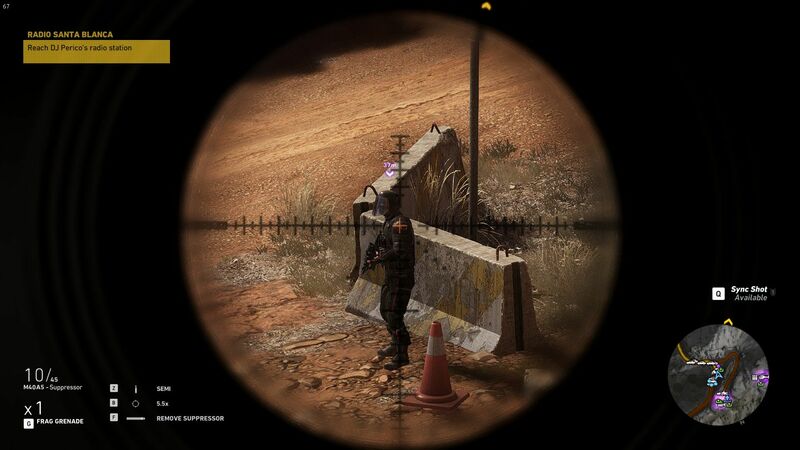 Unidad forces are highly recommended to be killed in stealth, if not, they will send out patrols to hunt you down and kill you and they will not stop until you either lose them, or you die. 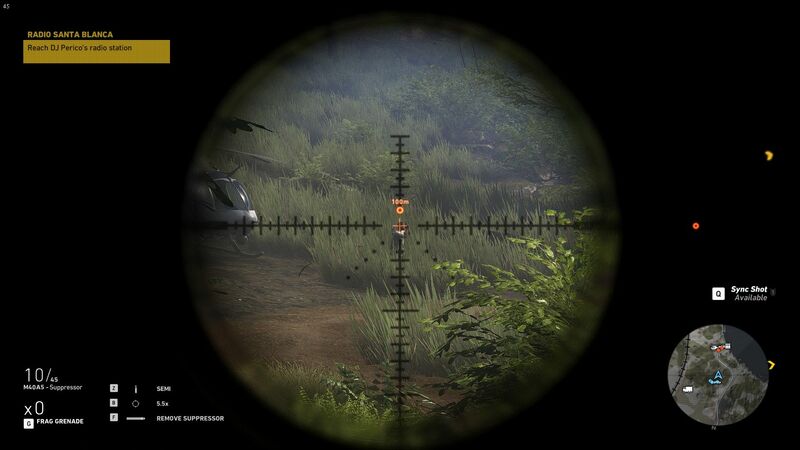 There are seveal levels of Unidad patrols, the first chevrons meaning that they wil lsend small patrols to hunt and kill you, but once you kill more Unidad, they will send more each time, raising your 'wanted level', making them want to hunt you down with more force, sending in attack choppers and armoured vehicles. The drone and binoculars are the most useful tool to scout an area if you wish to make an assualt. They allow you to see at a distance to mark enemy positions and display their corresponding class icon through walls and on your minimap. The drone is easily the most used tool that you have, being extreamely useful for scoping out enemy encampments and bases from a distance. By default, your drone cannot go very far from your player without losing connection and disconnecting, causing you to wait for the cooldown, the same goes for the battery of the drone, this stops you from using the drone indefinitely, once it has depleted you'll need to wait for the cooldown too. Both of these restrictions can be upgraded in your skills menu under the Drone tab, these are all the skills that you can aquire for your drone when you reach the require level, skill points and resource levels. Drone range is by far the most useful upgrade, it allows you to fly your drone further away from your character before disconnecting, this allows you to maintain a safer position away from the enemies so you don't get accidentally spotted whilst using the drone. The battery however, allows you to use the drone for longer, letting you sweep over the area as thorough as you wish. But the one thing that stops the drone from being a stealthy option is that it makes noise, this can alert enemies if they are is hearing range and they will go looking for you. This can be easily solved however through the skills menu where you can purchase the stealth skill that minimises the noise your drone emits. Though many players underestimate their ability and opt out for using the drone, the binoculars are the tool you use when there is a jammer in the area, preventing you from flying the drone at all. 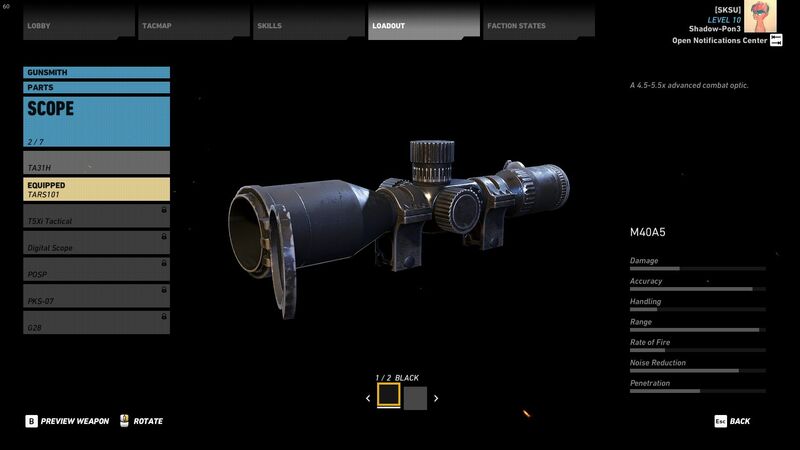 The binoculars have a zoom setting that can be aquired through the skills tab and can be used for mid to long range spotting. The binoculars however have a useful function that the drone doesn't have. A range finder. 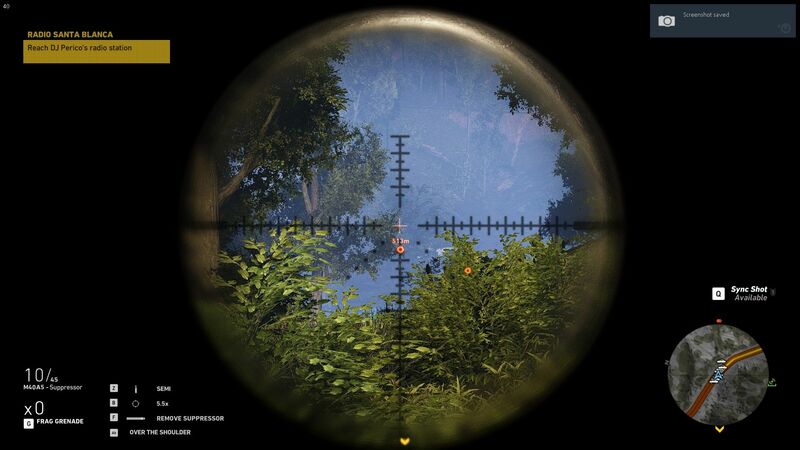 This is the most useful thing when attempting long range combat and can determine if you will hit your shots or not. 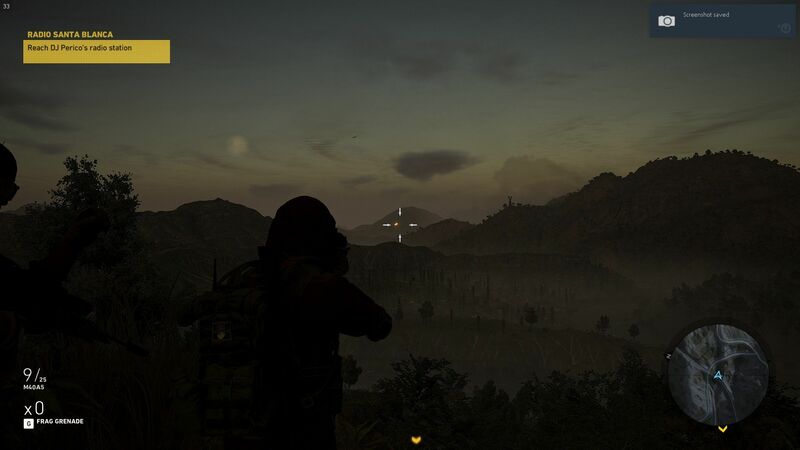 If you look to your radar when in close vicinity of an enemy, there will be a red circle (or purple if Unidad), this shows that there is an enemy located within the circles vicinity that hasn't been spotted yet. clearing all the transparent circles of enemies will clear the minimap and provide you with individual locations of each enemy. Depending on the amount of enemies in the vicinity will change the intensity of the circle, if it appears clearer, there will only be one to two enemies present, but if it appears to be an almost solid colour, there could be upto 3-5 enemies there. This is what it looks like when you have unspotted enemies within the area. The enemy that was within that circle has been spotted and accurately marked, showing them as a orange (or purple if Unidad) circle. 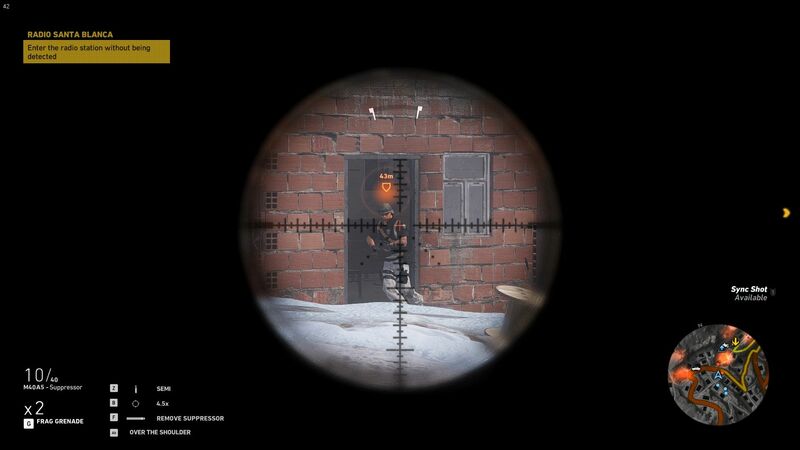 The spotted enemy now has their class icon above their head and some small information about them when you look over them with the drone or binoculars. It also shows the distance from where the enemy is to you.